AJ Styles celebrates after his win as John Cena contemplates what’s ahead for him at WrestleMania. Sunday night marked the last of the WWE brand-exclusive pay-per-views as SmackDown ran the final show before WrestleMania in April at the Nationwide Arena in Columbus, Ohio. The main event featured five guys – but no burgers or fries – and the undercard was less than stellar. Maybe that’s a reason why, after WrestleMania, WWE is doing away with the brand-exclusive pay-per-views. The original idea of the brand extension is good, but it seems like both shows dropped the ball with pushing new talent. And that’s the reason why these brand-exclusive events just fall flat most of the time. Here’s a match that happened after 7:30 p.m. ET and ended before 8:00 p.m. ET. The good guys won. Rawley took the pin. He won the Andre The Giant Memorial Battle Royal at WrestleMania 33. These guys all deserve better placement. I feel incredibly bad for Rusev. He’s shown he has the talent in the ring the last few years and the ability to adapt to any gimmick WWE saddles him with, but he still can’t seem to catch a break. His latest match against Nakamura is a perfect example of it. Rusev could be a dominating force in the mid-card right now and a potential main eventer down the line, but anyone who watches WWE television knows Rusev’s only getting time because his Rusev Day gimmick has taken off; I’m sure beyond WWE creative’s wildest expectations. Pitting him against Nakamura was obviously just a way to get him on the card while Nakamura bides time until challenging the WWE Champion at WrestleMania. And while these two had a good match Sunday night, it still means nothing for either party. The fans in Columbus were solidly behind both guys, and it’s a good thing they didn’t turn on Nakamura. WWE kind of got away with one here because I could easily have seen the crowd go 100% full pro-Rusev during this match. Rusev looked good in the victory and showed he can hang with one of SmackDown’s best. Nakamura nailed Rusev with the Kinshasa after escaping an Accolade attempt, then hit him with another one to seal the victory. Orton and Roode haven’t had much time to really build a rivalry, but this was a fun match to watch, especially towards the end. Orton never won the United States Championship, so the storyline heading into this match was if Orton can become a Grand Slam Champion, having previously won the Intercontinental Championship, the World Heavyweight Championship and the WWE Championship. After a back-and-forth affair, Orton was able to hit Roode with the RKO off the middle rope, cementing his legacy as a Grand Slam Champion. After the match, Jinder Mahal entered the ring and attacked Orton. Roode was still at ringside, so he saved Orton and gave the Glorious DDT to Mahal, and then gave it to the guy who had just defeated him in Orton. Triple Threat anyone? Good way to get more of the women on the show with Charlotte defending against Ruby Riott later in the show. It was a standard tag team match, which wasn’t great but not bad. Carmella yelled for Natalya to grab her briefcase with the referee’s back turned, but Lynch knocked Natalya off the apron. She then ran right into a superkick by Carmella, who then pinned her for the victory. The match saw both teams doing signature moves from the other team. The Midnight Hour by the Usos and the Uso Splash by Kofi Kingston – simply awesome. However, there wouldn’t be a clean winner. The Usos flew to the outside over the top rope onto all three members of New Day before the Bludgeon Brothers came out and completely demolished both teams for the double-disqualification finish. The way Luke Harper and Erick Rowan dismantled both teams was pretty impressive, but nothing was more cringeworthy as the powerbombing Xavier Woods onto the steel steps. That even hurt me. With Riott in her first high-profile championship match on the main roster, Riott Squad showed up in the middle of the match but didn’t touch Flair. When they seemed like they were going to, Naomi and Lynch ran out to back up the champion. There were some very innovative moves in this match, my favorite being Riott trying a reverse hurricarana only for Flair to fling her back and into the turnbuckle. Flair got Riott to tap out to the Figure Eight, but that’s when the real fun started. Shortly after the match, Asuka’s music played and she entered the ring. She and the SmackDown Women’s Champion were face-to-face as the challenger pointed at the WrestleMania sign. It’s official: Asuka has jumped to SmackDown and will take on Flair for the SmackDown Women’s Championship at WrestleMania in New Orleans. It’s the best women’s title match WWE could have booked on either brand, and I think a majority of fans understand that and are totally on board with that. I’m one of them. And I’m also here for the possibility of Flair turning heel after Asuka defeats her and having Carmella cash in the Money in the Bank briefcase she still has to hand Asuka her first WWE loss ever. Just imagine the heat. Imagine the story. And imagine another streak being snapped in New Orleans only four years after the Undertaker’s undefeated WrestleMania streak was snapped by the current WWE Universal Champion. I’ll say this – when WWE books multi-person main event pay-per-view matches, they almost always certainly deliver. The last few certainly have, and Sunday night was no exception. 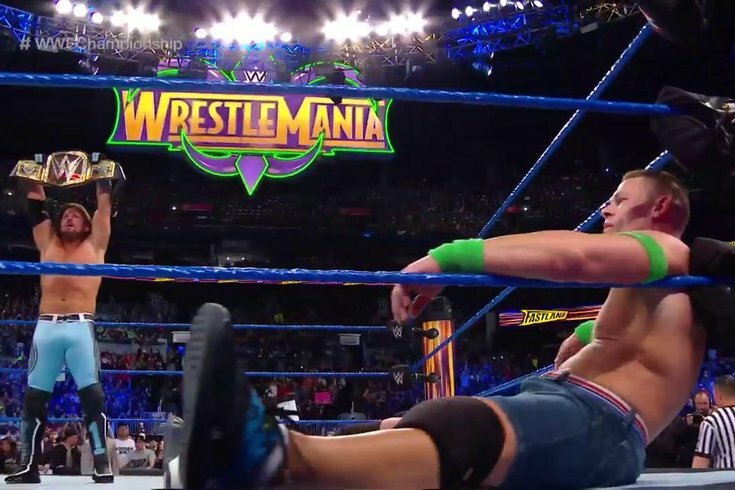 There were multiple storylines at play during this match and at the end, it seemed like the picture for WrestleMania was a little bit clearer. While the television editions of SmackDown since the Royal Rumble have left a lot to be desired by not only the fans but yours truly, Fastlane’s main event delivered as well as it could have given the circumstances. With Corbin, Ziggler and Cena randomly being added to the match, it was almost a foregone conclusion Styles would retain. But that didn’t mean these six superstars couldn’t have a great match, and that’s exactly what they did. SmackDown commissioner Shane McMahon was at ringside for the entirety of the match, and that obviously came into play with Owens and Zayn. Three great angles came out of this match, and Owens and Zayn not trusting each other in the end was the best way to go, with or without McMahon’s involvement. At one point during the match, Zayn laid down for Owens to pin him before Zayn rolled him up in a small package - one of the best moments of the match. Hopefully this cements Owens vs. Zayn for WrestleMania without McMahon’s involvement. At the very worst, maybe McMahon can be a special referee. But I do not want to see anything resembling Owens or Zayn facing a McMahon. I’m over that. But all three did a tremendous job Sunday night. McMahon is a true heel and it’s interesting to see the crowd reactions, whether they realize it or not. The second and third angles coming out of this match were the future of Cena and Styles retaining and facing Nakamura at WrestleMania for the WWE Championship. The Cena storyline is so well done, but so many people are overlooking it because of their distaste for Cena. I get it. But at the same time, I love the story they’re telling with him. He’s trying everything in his power to get to a prominent match at WrestleMania and has failed each step of the way. What’s next? Stay tuned. Styles and Nakamura may be the best WrestleMania match in years. Maybe even a decade. Cena figuring out what he’ll do will lead to some good, if not great, segments on television these next few weeks. Owens and Zayn will hopefully build another rivalry for the ages. The only thing missing from their last rivalry a couple of years ago was a WrestleMania match. And now we’re so close to getting it. While the pay-per-view as a whole wasn’t that great, the main event did what it was supposed to do. We may not know the direction of Corbin or Ziggler, but that’ll play itself out in the coming weeks on television. As for the three storylines coming out of the main event, Asuka challenging Flair, Orton becoming a Grand Slam Champion and the Bludgeon Brothers now in the Tag Title mix, SmackDown’s got some pretty good storylines heading into the biggest show of the year. Now if only the television programs can get going. Follow Nick Piccone on Twitter: @nickpiccone.